Welcome to The Making Of The Faraway Tree! First, let me say that this is not a tutorial. It's more like a behind-the-scenes to its construction. 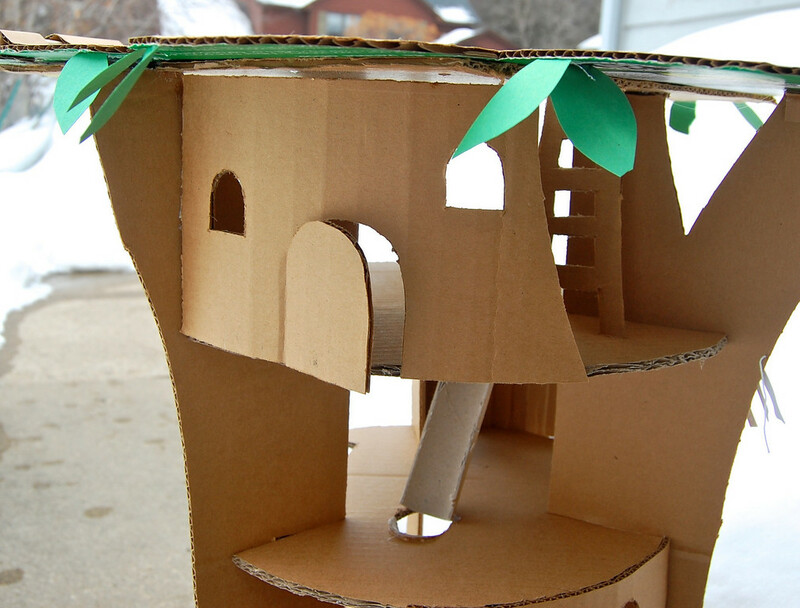 Unlike sewing, which is better illustrated with detailed step-by-step instructions, building with cardboard isn't. 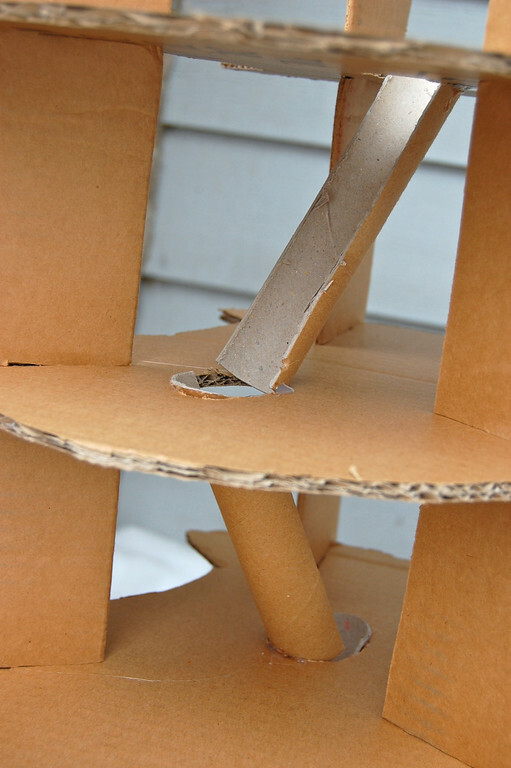 Often a person can tell just by looking, how a cardboard thing is put together. Second, while I'd been letting the idea of a Faraway Tree model percolate in my brain for a long time, I didn't hit on the final layout until a month or two ago. 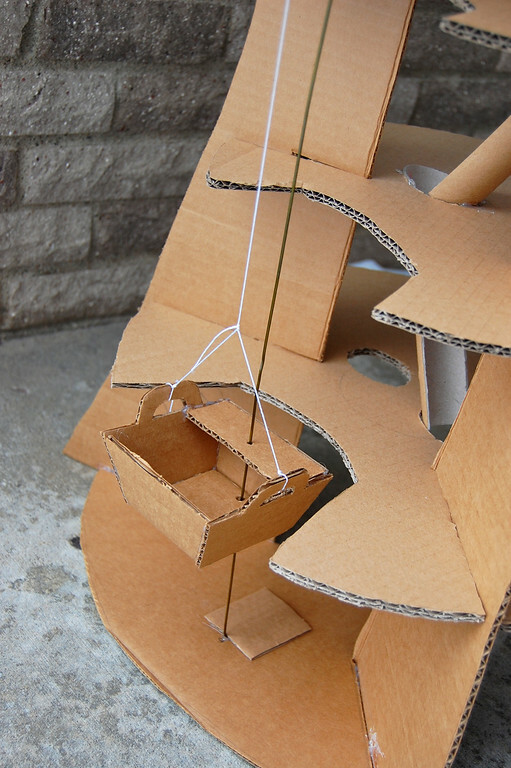 Before that, I'd considered a swing-open style like this dollhouse, and a twisty Slippery Slip using some kind of clear tubing from a hardware store. All doomed to failure for all kinds of reasons. Then I saw this rocketship at a friend's house while on a playdate and it clicked. 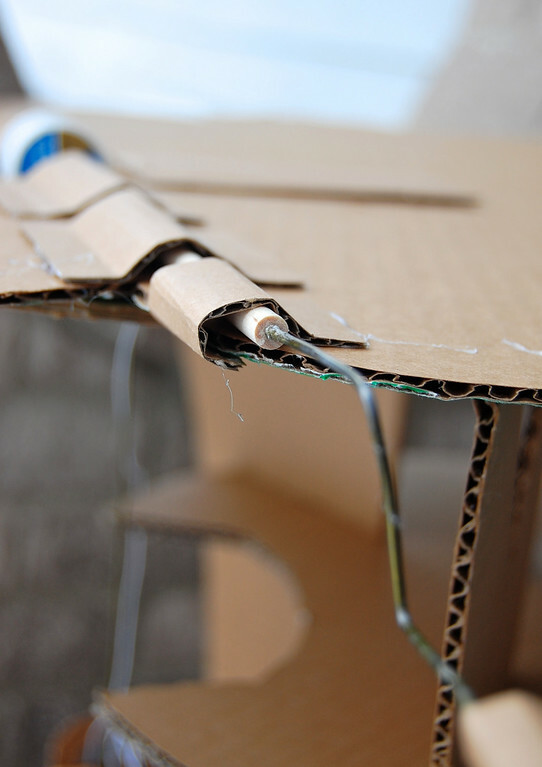 Incidentally, I also want to build the rocketship itself from cardboard (how easy is that?) but that would have to wait till I'd done the Tree. 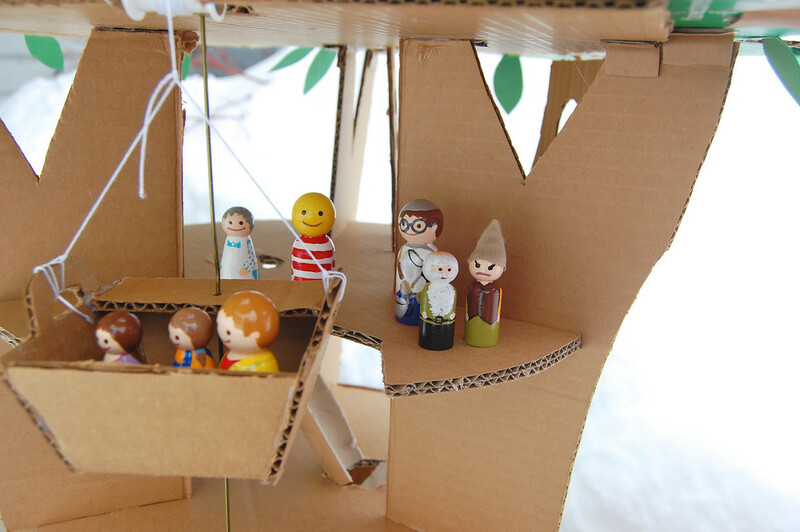 Looking back at the toys and playthings I've made for the kids, their favorites have been the ones that do something. They appreciate the aesthetics of something handmade, yes, but they also want to know how that something works. So if you've been reading this blog a while, you might have seen this trend in my toys - most of them do something beyond just being a softie, or a cardboard box. 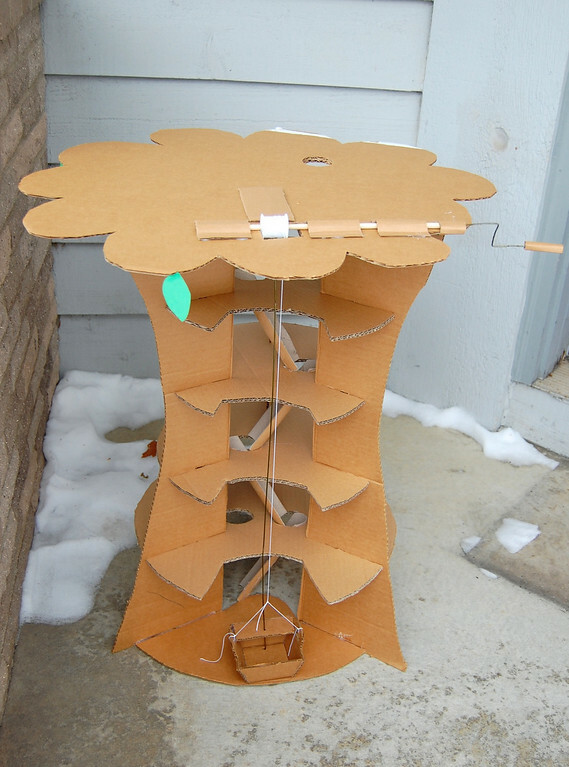 This Tree could have been just a static free-expression treehouse they could decorate with their markers, but it is a lot more fun with a working slide and elevator! They slot together without glue. Some Physics principle keeps them standing firm. 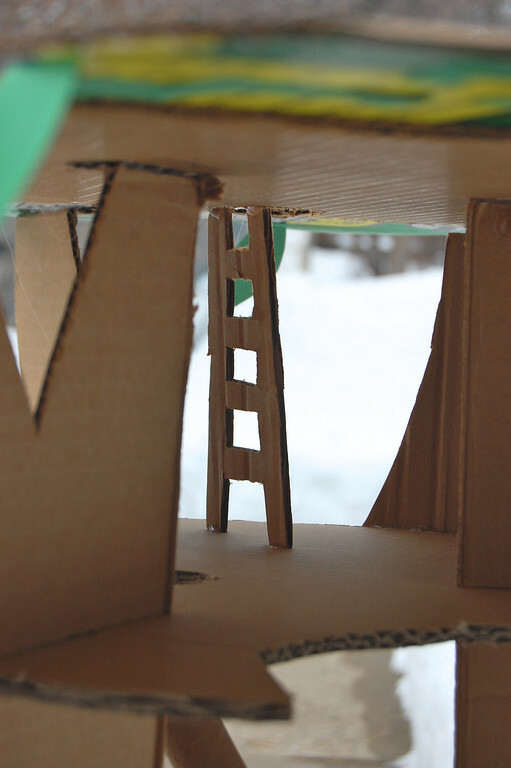 In the picture above, I cut a large central hole in each of the floors, to position the chutes. These holes would eventually be off-center, and I wanted some room to manipulate the chutes to get the best positions for a smooth ride. You'll have to do some actual testing! The chutes were made from a robust inner tube of a roll of wrapping paper. It was halved lengthwise, cut into pieces and glued to the edges of the holes. With the chute done, the elevator was assembled next. First, the roof of the Tree was glued on. Then, a little basket was made, and holes poked into it. This was threaded through the stabilizing pole. If I had been bothered to leave the house, I'd have bought a long skinny dowel from Michaels and sawn it down to size. But instead I found a wire coat hanger and straightened it. Not as lovely as wood, but free. If you are making this, do not be tempted to leave out the pole. Without it, the elevator swings free, crashes into the sides of the shaft and gets stuck. Your kids will thank you for doing that extra step. I cut the coat hanger to length, and saved the leftover wire bit for a crank. This was made by drilling a hole in the end of a short dowel and gluing the wire bit into it, then bending it to shape. Next, I tied string was tied to the basket and wound the other end of the string around an old thread spool. 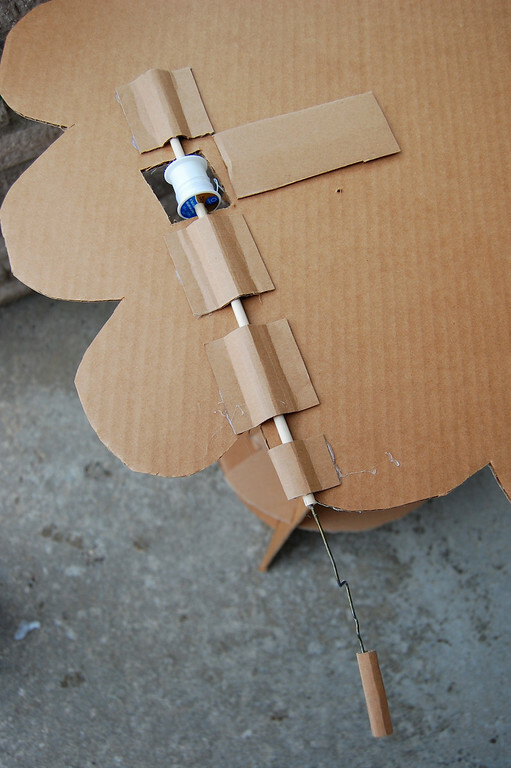 The short dowel was threaded through the spool, glued in place and the spool suspended over a hole in the roof. 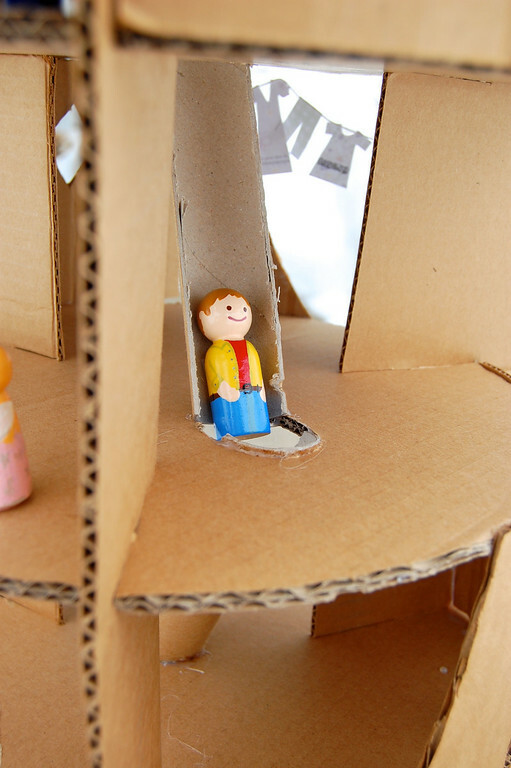 The dowel axle rotates freely within a little cardboard tunnel. For visibility, I used short pieces so you could see the dowel under and between them. This took me three days (which is nothing) to make it - working only in short spurts whenever the kids didn't need me to serve snacks, or draw princesses, or read books. The completed Tree is about 30" tall. It's big, but it's cardboard, so when it falls apart, it gets tossed out without feeling like we spent a lot of money on it to take up space in our house. Emily has plans to decorate it in the near future. I don't care- I like the natural look, but it belongs to the kids now and it's out of my head at last, so I'm happy! this is stunning! My son would love such a thing, he's captivated with the faraway tree. 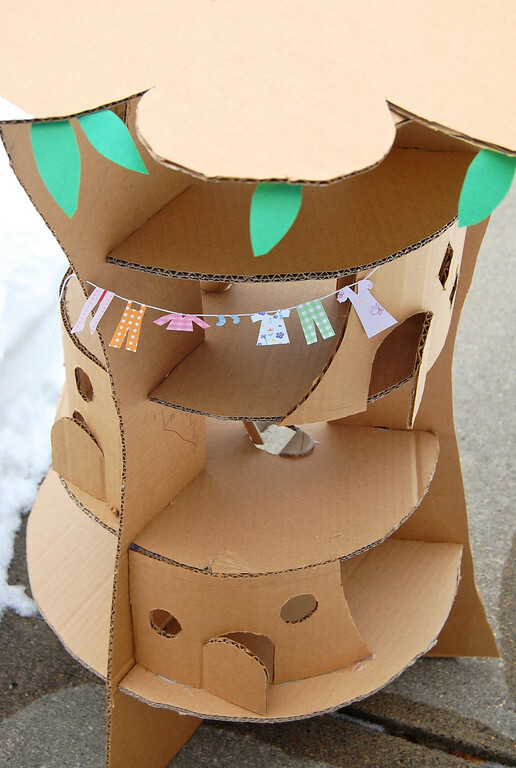 Definitely a project for us to try out, just need to collect some cardboard first.. Thanks so much for sharing it! I've never read the books but that looks like a kids dream!! I think I just died and went to cardboard heaven. This is AMAZING. Wow, you're amazing!! What a masterpiece - I'm sure it will entertain your girls & friends for hours on end! This is so cool. I absolutely love the elevator. 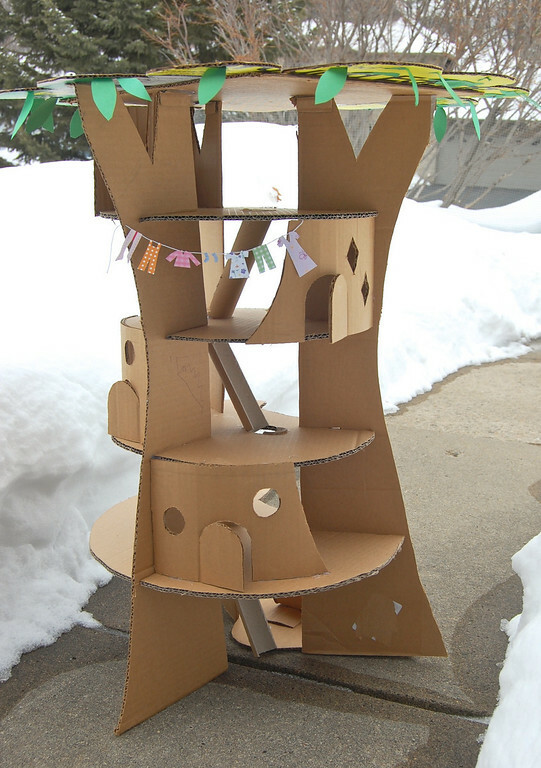 Now, I'm trying to think how I'll get enough cardboard to make that. I love this so much, Im stuck for words! 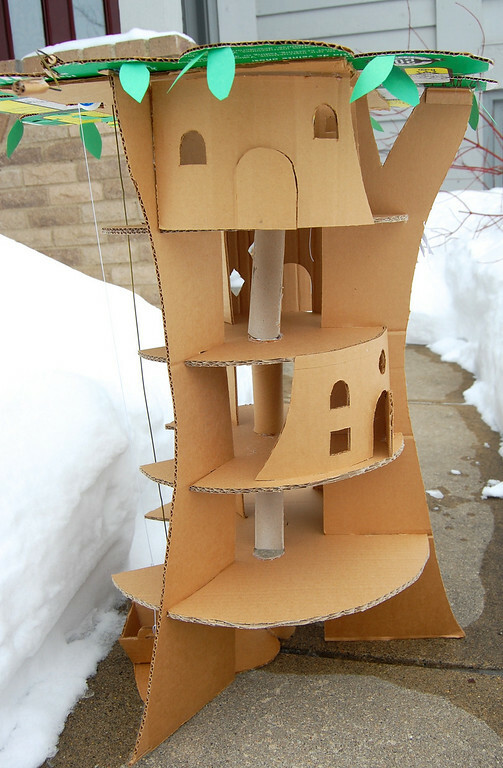 How gorgeous, you are so clever to create this from ordinary cardboard, and the working elevator - genius! 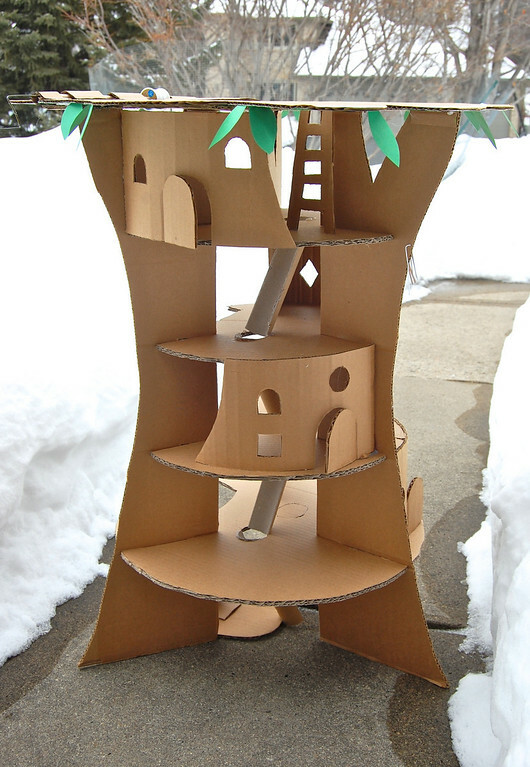 What a beautiful playtree :) It looks very cool, can imagine my boys would love to play. Holy cow that is fantastic!!!! I loved the faraway tree when I was little and I am super impressed with this tree. Wow, this is amazing ! 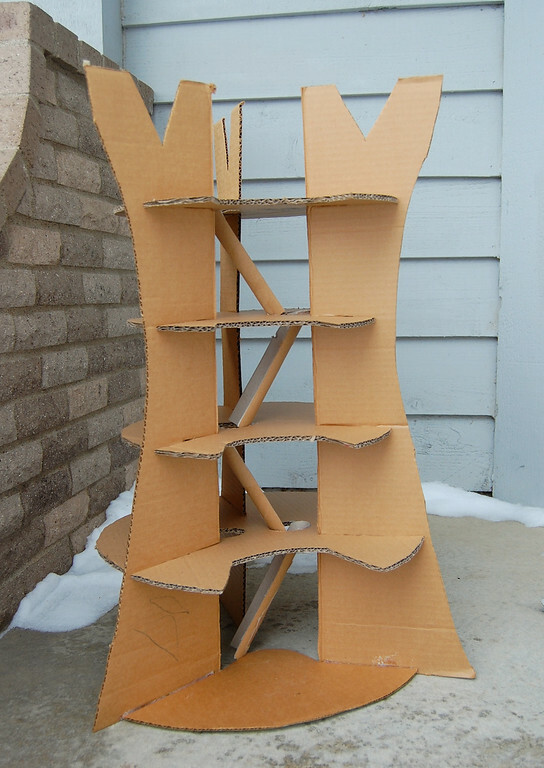 I have a cardboard garage in mind since a long time, you just gave me the piece I was missing: how to do an elevator. Thank you once again for sharing your wonderful projects ! You are so creative! I love this idea. The kids have so many toys that take up space that they lose interest with after awhile. 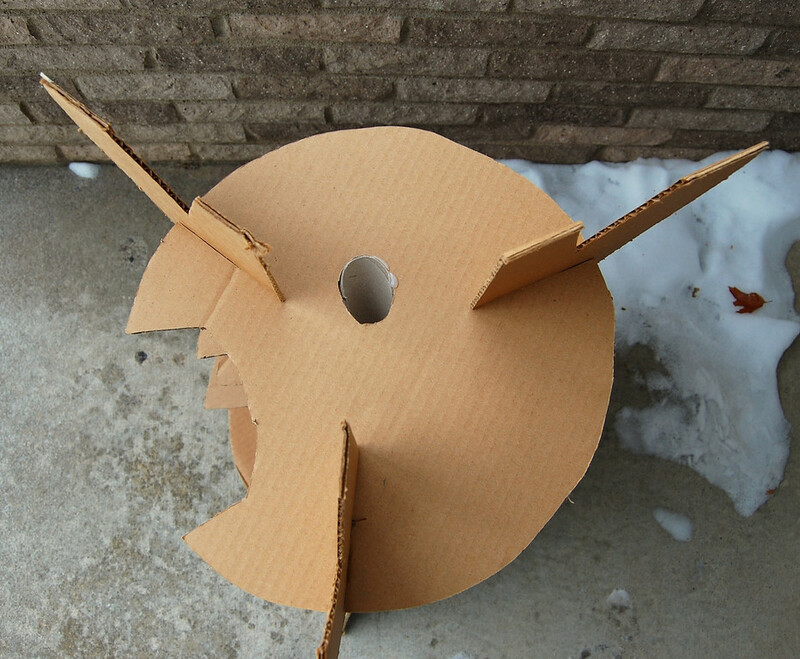 I love that they can play with this and then once its time has passed you can recycle it. I imagine this will have lots of playtime. Great job! Johnny (sitting on my lap): "Could you make me a doll?" Blogful: This happened to be one of those lucky boxes I found that was long, large and picture-less. Most of the cardboard I use has potato chip or olives or Samsung speaker adverts on one side. And I use diaper boxes too, although now that everyone is potty-trained, we don't have any more of those in the house. I use kitchen scissors and a box-cutter/x-acto knife to cut it. 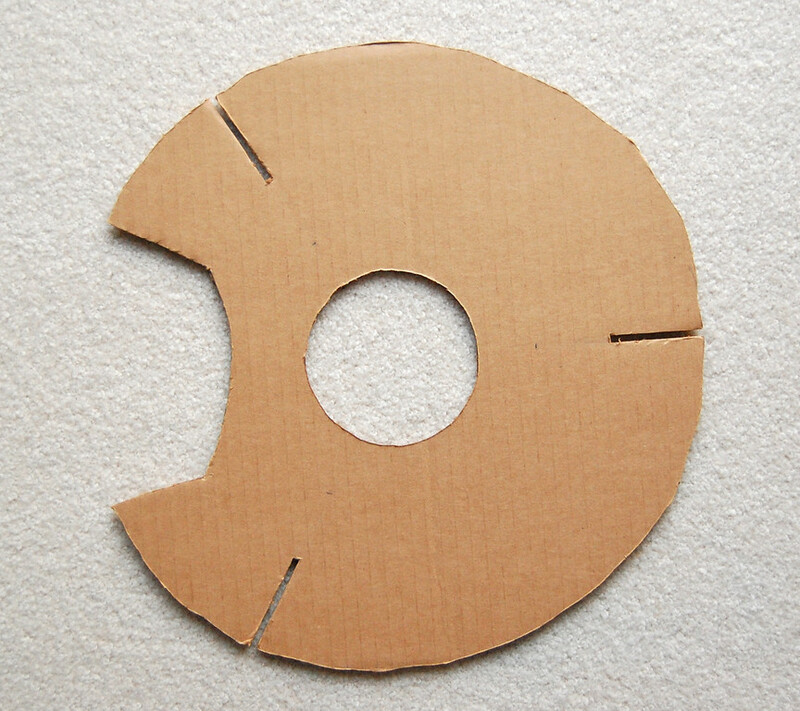 If the cardboard is thin, I'll lay it on my cutting mat (same one I use for fabric) and cut. If it is thick, I'll stand the cardboard upright and saw with the knife. 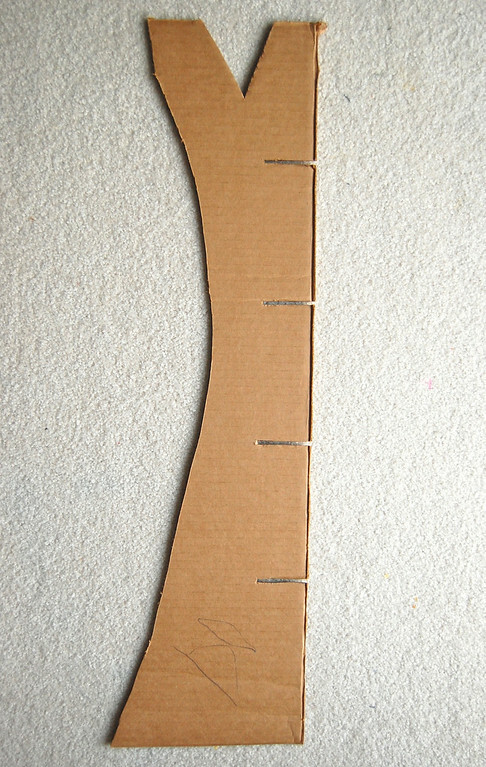 The creasing has a lot to do with the direction of the cardboard- the spines/ridges of corrugated cardboard can be used to advantage if you choose. 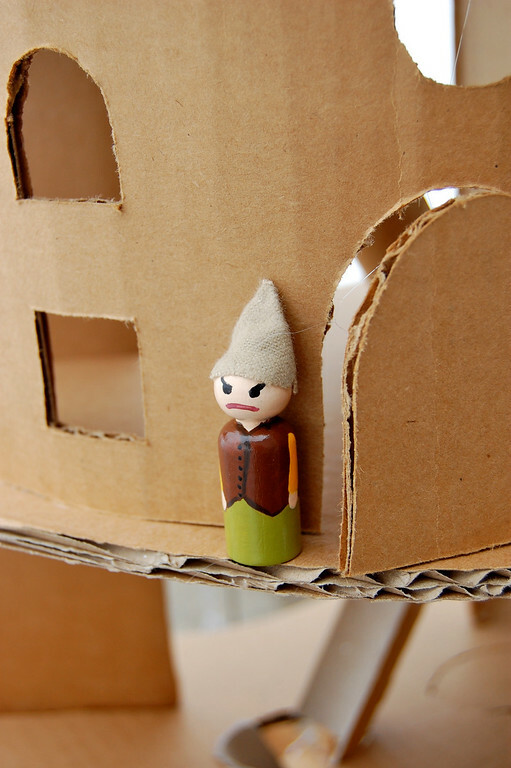 Some day I should do a post on working with cardboard, maybe. Then I can put in all this stuff into an official tutorial! Ah, that is still on our to-read list; right now we are at 'Come to the circus'. Bet you'd have made the big top to go with it, and a little house for Cackles the goose which goes shopping! But maybe I'll make some version of the tree - if the book is well received. The way we do novels here is 2-3 chapters at bedtime, with options to choose something else, so it invariably takes very long! Fantastica, muy creativa y amigable al ambiente. Gracias por compartir! Fantástica,muy creativa y amigable al ambiente. Muchas gracias por compartir! LOVE this. Thanks so much for sharing how you did it. My daughter (and I, I must confess) are obsessed with the Faraway Tree and I'm going to try to make this for her upcoming birthday. And I was thinking it would be fun to try to re-create some of the lands that arrive at the top of the tree too. Like birthday land: crackers on legs, a horse for Jo, fairy wings for Bessie, mini cakes and party games. Myriad possibilities. Thanks for the inspiration. PS: Your little Angry Pixie kills me! This is fabulous! What a wonderful piece of creativity! ¡Hermosa! ¡Quiero hacerla yo misma! Muchas gracias por compartir esto. Hi, my name is Nik, and I'm a cardboard-aholic. And YOU... you are an enabler!! (THANK YOU!) Love this! Can't wait to make one, customize it, and apply the idea to multiple other themes. (And just to defend my man-card a bit, I'm a heavy crafter, but I don't sew! HA!) Thanks for the inspiration! THANK YOU, THANK YOU, THANK YOU, THANK YOU, THANK YOU for posting how you made this! Growing up in a small town in Malaysia, Enid Blyton's books were often my only escape. This was one of my favourite stories and now I can make one for my son. I'm so thrilled you made the Saucepan Man, he's my favourite! 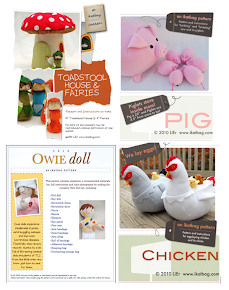 The Sep 2011 Family Fun Magazine featured your idea. But I have to say... Your tree house with the pulley is way better. 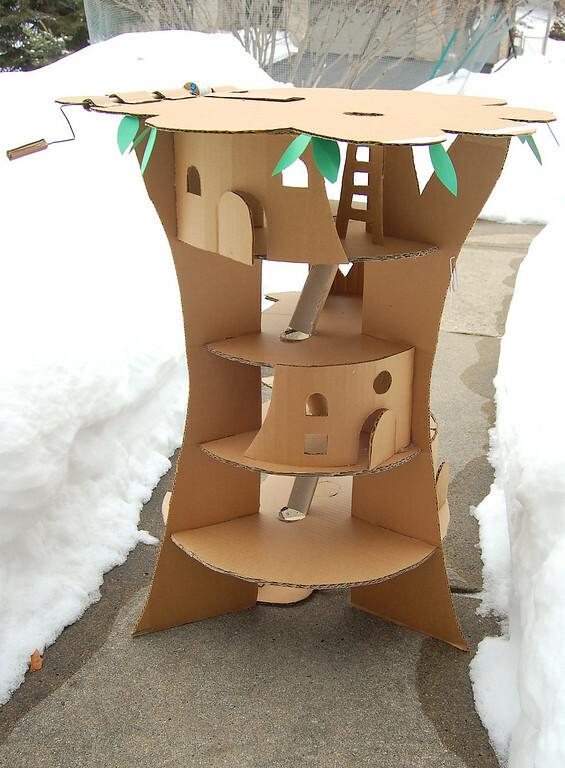 I am turning this into a tree house for my boy's cars. THANK YOU!!! OMG! The Folk of the Faraway Tree sits proudly on my bookshelf waiting for my own children to grow big enough to listen to me read it. This is such a fantastic project, and chock full of recycled materials. Thank you so so much for publishing it! I just saw this in the Family Fun magazine today. My first thought: wow, this looks like a ripoff of LiEr's! My second thought: but hers is better! I am so impressed with this project. My kids know this book off by heart. So we are going to attempt to recreate this at our place. Question how did you make the little people or where did you get them. They are just adorable. Amy Ryan: Thanks! 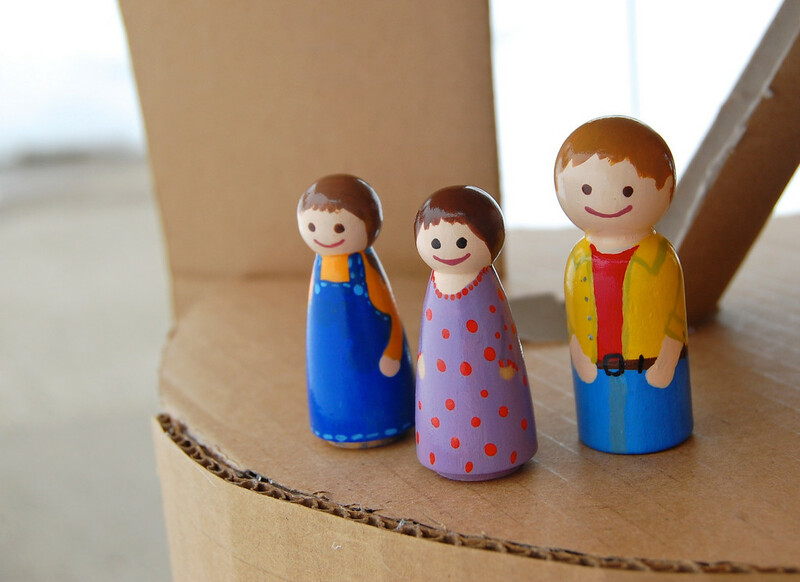 I painted peg people to make the Folk of the Tree. Already we've lost Bessie (or Fanny), grrr! You can buy the blanks at most craft stores (Michaels, Hobby Lobby etc) and paint them with regular acrylic paint and a top coat of polyurethane varnish (from same aisle as the acrylic paints). I used a toothpick for the fine details like eyes and lines. Wow! This is amazing! 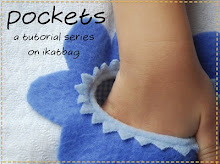 I'm going to try to make it for my 2.5 year old. What are the sizes for the floor circles? Oh, I would love a tutorial with dimensions - I think my pieces would not match up correctly! This is amazing. Ok, my mouth is stuck to the floor. And I am printing this out as an inspiration. Wow! 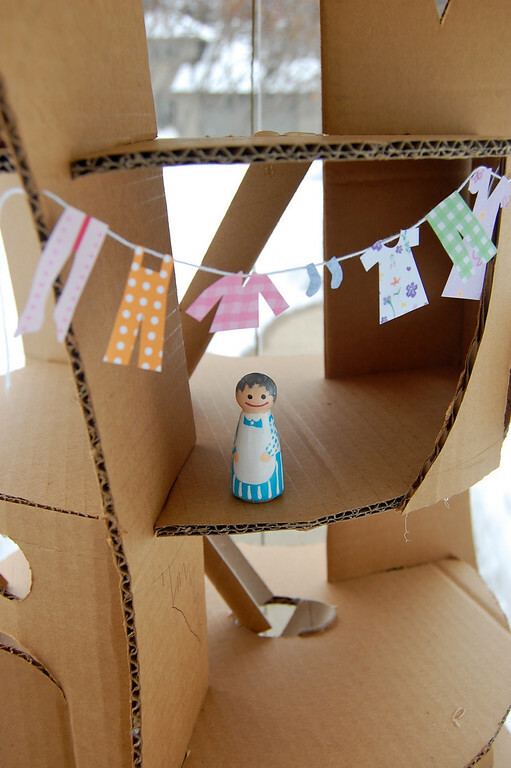 I have a LOVE of all things cardboard (I know I am a bit strange) and this is such a creative way to use it! I would love to feature this on my blog - would you mind if I linked back to this article? My daughter saw this in the family fun magazine from disney! We just had to make it! Hopefully i am able to make the people. What an awesome idea! My daughter is going to love making this! Breathtaking idea! Thank you for great inspiration! So cool! I like it very much! You are very creative! Congratulations! Ficou muito linda. This is beautiful. This is fantastic. Can't wait to introduce this to the childrens in school and see how we get on.